I love morning! I know not everyone does, but I really do! I love waking up to a beautiful new day so full of opportunity! Each new day is also a brand new chance to jot down what you want in your BestLife! This week is all about TODAY! Today I will encourage everyone I talk to with my words and actions by focusing on…..
Today I will focus on feeling good by…. Today I will choose to know that I am amazing for just exactly who I am! I love that I …..
Today I celebrate my strengths! They are…..
Today I will see opportunity everywhere I turn because I know…. Today I know I want …..
Today I chose to let go and let God by ……..
Journaling is simply sharing you with you by writing down your feelings, inspirations, and ideas. I’ve included downloadable templates below to help inspire you. You could also use a notebook or sketchpad. Read through the list and find one that inspires you and simply start writing what you’re feeling/thinking. That’s it. There isn’t a wrong way to do this! Don’t worry about handwriting, spelling, or what others will think because this is all about YOU! You could include pictures (photos, magazines, printed), quotes, glitter, markers, paint, chalk, stickers or nothing but ink. It’s all perfect! Today I …. sometimes it’s easier to focus on tomorrow or yesterday. Sometimes we get a little wrapped up in what has happened that we wish we could change or what might happen that we would like to control. Neither is actually possible, but today, today we can still work with! Today is alive and all around you! It’s a beautiful gift. In this second I am in control. And this one. And this one. Today I will do one sit up. Today I will drink one less soda. Today I will park a little further from the door. Today I will choose to speak kindly of my coworkers. Today I will clear off this one ….. So much magic it in TODAY! What you focus on gets your focus. 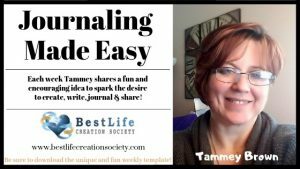 If you are struggling with a difficult layout or need help rewording a situation, feel free to email me at tammey@bestlifecreationsociety.com. I will respond. 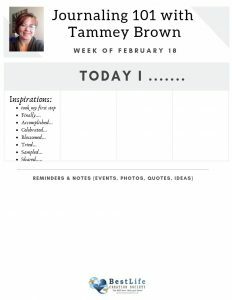 Click to open and print this easy-to-use journal page with this weeks Journal Prompt included at the top of the page! Simply start writing. 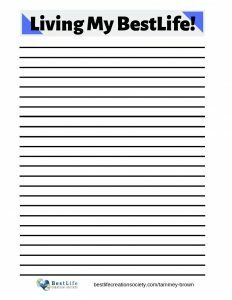 Click to open and print this easy-to-use worksheet meant to inspire you with layout titles and ideas! Included is a Reminders and Notes section to jot down ideas as you are inspired to use at a later date! These fun and creative templates are shared here to inspire and encourage! 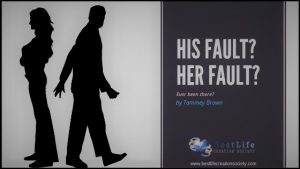 Feel free to share, but include a link back to this post. Thanks! 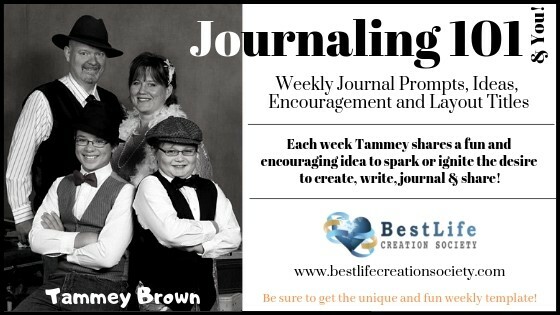 Each week I will share a journal prompt under the heading Journaling 101 in the weekly e-mail! The prompt is meant to spark ideas and action, but what you create is whatever feels good to you! Splats of color on a page with a quote on it IS journaling! A poem is journaling! Writing out your desires, prayers, dreams, ideas, and feelings IS journaling! So is scrapbooking. Here’s to living YOUR BestLife! Did you know there is an online, open workshop the second Thursday of each month? READ MORE! 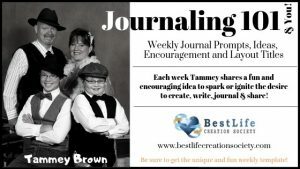 Feel free to leave comments/suggestions/ideas or examples of your journaling in the section below! Check out my Pinterest board for layout inspirations!